Topic checked by Luv ya;x, 30 September 2016 - 08:28 AM. Edited by asV, 20 April 2016 - 10:26 AM. *De ce? : Pentru că este un joc pe gustu meu și îmi place să joc foarte mult. 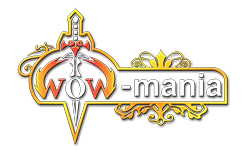 WoW-Mania is a 3.3.5a Blizzlike Server that reflects the experience from a Blizzard Realm. However there are also unique items, features and events that will enrich your game experience without breaking its original mechanics. WoW-Mania has been around for 4 Years and provide top quality content with a 99.3% uptime. x1, x2 (Default), x3, x4, x6 XP Rates - which you can change ingame to what you prefer. Playtime Rewards - The more you play the more rewards you get! Transmogrification - including 12.000 Transmog items from Cata & MoP and Weapons from Legion. More detailed information can be found on our Website and Forums.